Alex “Astro Girl” Chambers is an astrophysicist, a mixed martial artist as well as Australia’s first professional female MMA fighter. She is also the lightest competitor in UFC history. In July, she enters the 115-pound division in the first female-only The Ultimate Fighter (TUF). So, is she worried? I’ve always fought uphill. It’s just how it is when you are little. The road to where I am now has been long and seemingly hit a dead end on more than one occasion. In fact, it is almost a recurring theme. After my first 2 fights there was no one left for me to fight in Australia at my weight. To add to that, after winning my second fight I jumped up to celebrate and tore my ACL, which put me out for over 6 months. So when you see me doing the Karate Kid Crane pose, that’s because I couldn’t stand on the other leg…it’s now my trademark! Eventually after a year off we got desperate and my Coach Liam and I decided that I should look to fight in Japan where the WMMA scene is much stronger. They wouldn’t pay for the flights because I didn’t have a name yet, so we had a fundraiser at my gym, VT1, and we flew over to fight. My training partners, students and friends always show up when I need them, in that way I’ve always been so thankful. Unfortunately, because I was so desperate to compete, we had to take a fight up two weight divisions! I gave it my best shot, hurting her with strikes. I fought out as hard as I could, but I got caught in her specialty arm-bar. Following this fight there was another lull and I was pretty sure my career was over, there were simply no opportunities about. I kept hopeful and kept helping my team, kept training, until one day an offer came from Brace MMA promoter Kya. 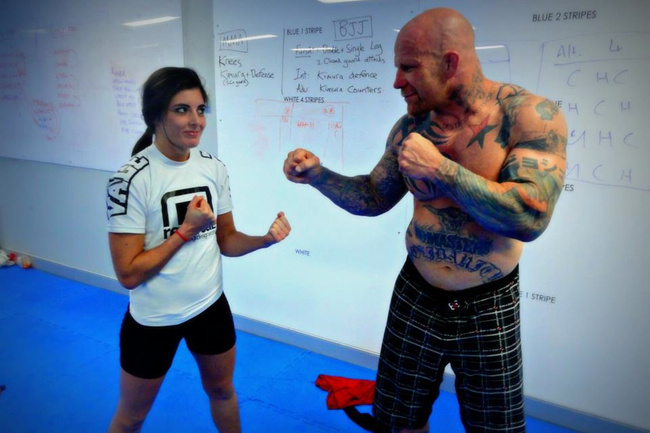 He was putting on Australia’s first female MMA show and wanted me to be the main event. My opponent was Mika Nagano “the Future Princess” with over 20 fights she is a terrifying opponent to see across the ring. Her ONLY stoppage loss had been in her first MMA fight against the legendary Megumi Fujii. She’s what you call an arm collector, a Juji Gatami expert. For the first time in my career, I honestly wasn’t sure I could win this fight, but there are times you just have to grit your teeth, roll the dice and not worry about the odds. Backstage people were warning me about her speed and how big she was for the weight. I stopped her in the first round by TKO. Her loss was mainstream news in Japan. Slowly I started to feel my career coming back around again. Then there was nothing. Like an ongoing nightmare my male teammates were fighting and moving up. I was on the bench...it seems like I had a reserved seat there. I was still Australia’s best Female MMA fighter, but I felt like an afterthought. This is the period my eyes started opening to the real business of MMA. It’s not just about the training, the fighting, it takes more than that to 'make it'. You have to be well rounded, understand basic marketing and present yourself properly to the fans and a handful or two of luck never hurt either. This is professional athletics, fair is not a word that comes off the lips of promoters. Just as I again started thinking about my career in the past tense my coach called me. I nearly dropped the phone. Invicta FC wanted to sign me! My heart raced and almost bounced up through my mouth. They signed me at 115 and I was ready to go. You have to understand, I’ve been doing martial arts since I was 8, it’s what I dream about awake or asleep. All the training in the world isn't worth a damn if you don't get to step inside a ring or a cage and throw down once in a while. What I didn’t know was that Invicta promoter Shannon Knapp had plans for me. She wanted to launch the atom-weight division and she wanted me in it. I guess I was starting to learn to have a little faith and be patient. So I flew over to America to fight Jackson’s MMA fighter Jodie Esquibel. She was a dangerous opponent, athletic, experienced, a devastating striker, and as some of us Aussies say “built like a brick shithouse” (which means she looked super strong!). Although it was a daunting fight, there was no way the door on my career was going to be shut again without a fight. Standing next to Cyborg backstage and warming up with Pat Miletech, Pat Barry and half of the MMA world made me feel like a teenager at a high school party. When we entered the ring, standing behind Jodie was Greg Jackson and her boyfriend Keith Jardine, I had to stop myself asking for a photo! Once we touched hands it all just happened. I finished her in under two minutes with a Rear Naked Choke. Backstage I was overwhelmed with joy, but also a bit of validation, I belonged. I no longer had to be jealous of my male teammates abilities to have a career with such ease and a plentiful array of promotions and opponents. This massive high faded to black once again in that now all too familiar feeling as I realized that Invicta had me in a holding pattern. Twelve months had gone by, and my coach started looking for alternative fights and we got one booked against a Korean champion. Despite being on contract, Invicta still had my best interest at heart and gave me permission to fight in the other show. In the middle of my fight camp, it was a Wednesday, around 1pm, my coach called me. He had to pull over on the side of the highway as he was having an anxiety attack…that’s just between you and me…vault it. I asked him what had happened. When he told me, I couldn't believe it until my phone simultaneously started flooding with congratulations from social media. The UFC had bought my contract from Invicta along with ten other girls, I was going to be on their first female-only Ultimate Fighter, the winner gets the title. It has been months now and I am still walking on air! So when people ask me, does it scare me that I’m the smallest UFC fighter ever signed? I tell them straight up…who cares…I’m in the UFC! I might be small, but I throw dynamite. Catch me in July…if you can.